Ever since Matchroom and DAZN USA have linked up, they’ve been crying out for a card that will really make its mark on the American scene. With its lack of hype and underrated fights, Saturday’s listing of matchups at Casino de Monte Carlo could be just that card. 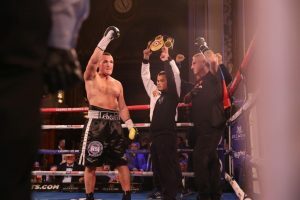 Headlining in Monaco on Saturday will be former WBA cruiserweight champion, Denis Lebedev vs. American, Mike Wilson 19-0 (8KOs). Okay, hands-up you got me at the first hurdle. The headline act on paper is not one to catch the eye. Lebedev’s experience and accomplishments vs Wilson’s professional record, make this look somewhat of a mismatch however, ever since Denis was beaten on points by fellow Russian, Murat Gassiev in 2016, he’s fought and won twice in two extremely disappointing bouts. A decision victory over Mark ‘Bam-Bam’ Flanagan in 2017 and his only fight of 2018 so far, a third-round stoppage over 30-2-0, Hizni Altunkaya. The Altunkaya fight was the first time Lebedev has weighed in over the 200lb limit (212lb) since 2009, and it showed. For just over seven minutes, the boxer many viewed as the man to beat at cruiserweight just two years ago left himself wide open throughout, and although the Russian has one of the best chins in the game this seemed more of a reflex issue than anything else. The Flanagan bout last year was even worse, but the 39-year-old did get the win, and a stoppage although his Turkish opponent looked as if he wanted out after the first 30 seconds. Mark ‘White Delight’ Wilson may be unbeaten but he’s going to need an already passed his best Lebedev to have entered the ‘washed’ stage of a boxer’s career. Wilson was a fairly accomplished amateur heavyweight winning national titles in the mid 2000’s and taking part but losing in the trials for the 2008 Olympics. The Oregon resident does have attributes that can make life awkward for Lebedev such as his superior reach and his willingness to shift and move rather than plod forward. With Aleksandr Usyk currently in possession of every single belt at cruiserweight, and the second season of the 200lb World Boxing Super Series into its semi-final stage, there’s no guarantee that WBA ‘Champion-in-recess’, Lebedev or WBA ranked #11, Wilson will fight for the proper championship strap in the near future. And as Wilson himself said to the ‘Mail Tribune’ last month, Lebedev ‘‘…is long in the tooth now.’’ Let’s see if the American regrets saying age is in his favour when he fights the former cruiserweight king. 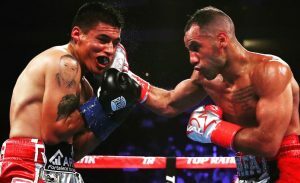 WBA Super-flyweight champion of the world, Kal Yafai takes on Mexico’s, Israel Gonzalez which is setting itself up nicely for the gateway bout to unification battles that Yafai, 24-0 (15KOs) has spoken about so regularly. Kal enters as the heavy favourite and the prize-fights that await next year should be more than enough motivation for him to make the 4th defence of his WBA title. However, if he’s not at his championship best, the style of his Mexican foe will be perfect to make it a rough night. Originally, Alexander Ustinov was set to be going up against unbeaten Chinese giant, Zhilei Zhang but due to visa issues, Michael ‘The Bounty’ Hunter has been brought in to arguably make an even more intriguing about. 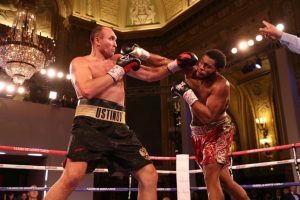 Just over one month ago, former Usyk challenger at cruiserweight, Hunter shocked a packed-out York Hall when he stopped heavyweight prospect, Martin Bakole in the 10th and final round. Now 15-0 (11KOs), Hunter entered the fight as the underdog, viewed by many as a ‘stepping-stone’ fight for Bakole, who trains out of Scotland, to then move on to title fights in 2019. That’s not quite how it went though as despite being equals going jab-for-jab, Hunter’s hooks and combination assaults were so much more effective and punishing to the Congolese fighter, who towards the end of the fight appeared to dislocate his shoulder and between rounds told trainer, Billy Nelson, that he wanted to quit. He probably should of because the 10th was a complete onslaught from Michael who relentless attack, if sloppy at times, forced the referee into stepping in and calling an early end to the fight. As long as he avoids getting caught early on, the California native would do well to employ similar tactics when he faces off against Russian, Ustinov. By the time Alexander ‘The Great’ Ustinov, 34-2 (25KOs) steps into the ring it will be one day shy of a year since he last fought; 18 months since his last victory. Last November Ustinov was out-fought and out-pointed by WBA ‘Regular’ champion, Manuel Charr. Consistently beaten to the punch by the smaller man that night means a lack of activity by Ustinov might not be his biggest issue when the first bell rings against Hunter. Before then, the now 41-year-old heavyweight was on a 7-fight win streak but, despite always being rumoured to be on the fringes of big heavyweight fights, the quality of his opposition has been subpar ever since he was stopped by Kubrat Pulev in 2015. If Hunter comes at Ustinov with the same ferocity and fearlessness as he did against Martin Bakole, it could end being an early night for the aged Russian. One of the most intriguing matchups of the weekend sees former British light-heavyweight champion, Frank Buglioni step in with former Chinese Olympian, Fanlong Meng for the IBF ‘Intercontinental’ title. Fanlong Meng, 13-0 (8KOs) is a southpaw who isn’t on WBC champion, Stevenson’s level just yet, but the former Olympian should be a good measurement of whether Buglioni still has what it takes to make a dent on the world scene. Meng turned pro in 2015 and moved quickly and globally to boost his name in the professional ranks having already fought in the US & Puerto Rico, China and Macao. Victory over the former British champion would represent the first ‘big’ name on Fanlong’s resume and propel him up the rankings from the 11th position he currently resides with the IBF.